My little brain has been busy this morning. First, I visited my friend at Child's Play. She's been doing some math turorials of late. 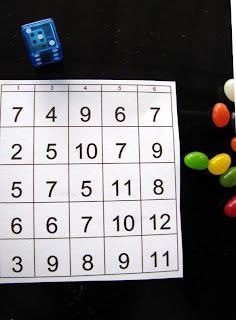 Plenty of time to jump onto the desktop, rev up Excel, and make some number Bingo cards. Some category-less, for made-up games. Some with categories, for subtracting. 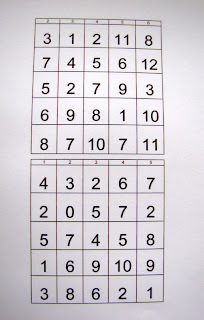 Some completely blank (so the babes can draw their own numbers). I made ours according to the dice we have - the fancy ones that my babes love. (They're pretty.) You could of course use two regular dice with this game. Example: The roll is a three and a four. Since this is an addition card, we add three and four. 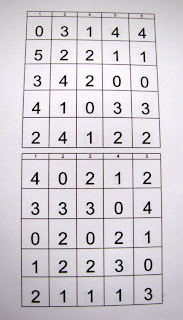 In the three category, there is a 7, so we mark it. In the four category, there is a 7, so we mark it. Ha! 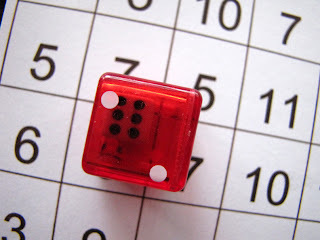 Variation: add another (third or fourth) dice and make larer numbers on addition cards. 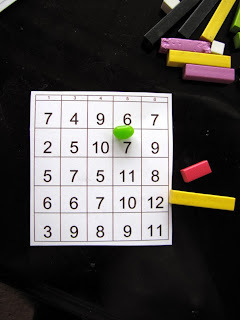 like these, or two different colors, make one of them the first number. Such as 2-6. Since Trev likes to use the calculator, we'll play both ways (with and without a calculator). Now - here's another idea I had. 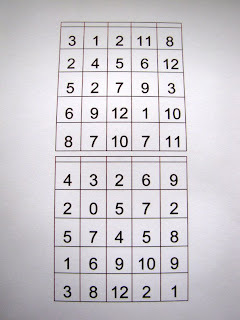 Use the same bingo cards using dominoes. Just draw a domino, and if you have the coordinates, you get to mark it. And how 'bout with Cuisenaire Rods? Put your hand in the bucket (in line with these particular cards, we'd use only the digits up to six) and either draw two rods, or each person draws a rod.If you have the coordinates, mark it. This card has a "5" category, so the seven is marked, but does not have a "2" category. Great idea! Looks like much fun. :) Where, if you don't mind my asking, did you find those cool dice!? I think she ordered them - I'll find out where. We're definitely gonna have to try this one, Damek's always up for any game that has to do with numbers:) I'm pretty sure I've seen those dice at the Utah/Idaho Supply. Although we still have the two the boy pilfered from your house (thank you). I'm very glad I just checked into your blog. For ages I've been trying to find out what those rods are called. We had some when I was a kid and I could never understand why on earth they were called "Queens and Air" rods. And as an adult I never knew what to Google on to find out their real name. My work is done now and I can sleep easy at last. Cheers. Cool idea for bingo too. Great math ideas Stephanie! Math is the area where I struggle, has never been my fortay. Thanks for sharing, we are doing this tomorrow.